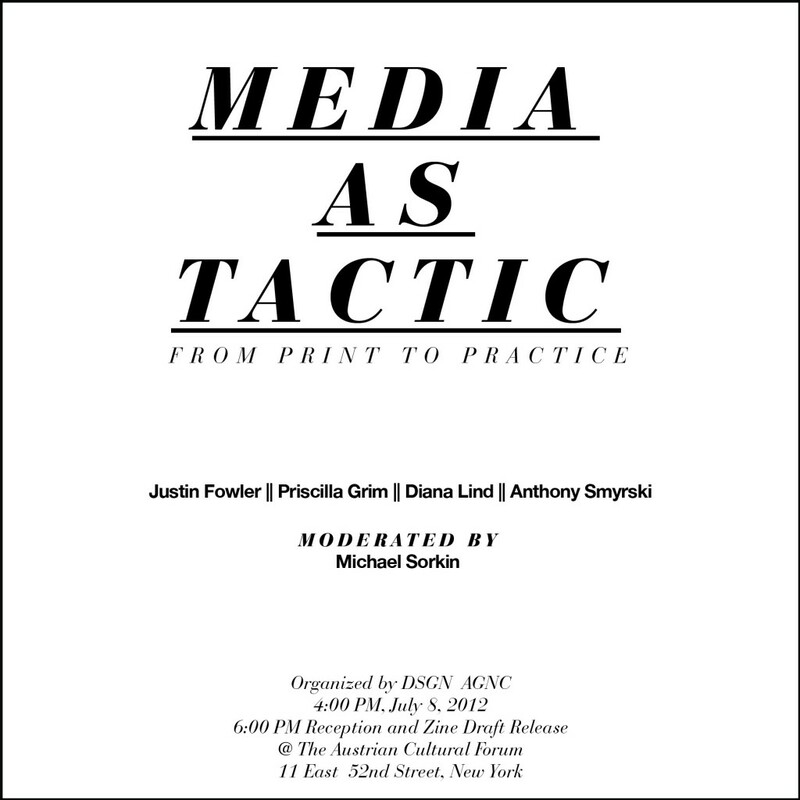 MEDIA AS TACTIC: from print to practice is an event organized by DSGN AGNC as part of a one-week artist residency at the Austrian Cultural Forum through an invitation by WochenKlausur to be a part of the Our Haus exhibit. The conversation will center around how different groups and organizations are using media as a tactic to advocate for change in the city, broaden the voices that are heard, and to apply pressure on official institutions. This is of particular interest as more media sources become available and the question turns from how we get information to what we, as a society, can do with it. Can media gain relevancy by creating opportunities for activism in both digital and physical space? Michael Sorkin is Distinguished Professor of Architecture and Director of the Graduate Program in Urban Design at the City College of New York. For ten years he was the architectural critic of the Village Voice and is currently contributing editor for Architectural Record. His books include Variations on a Theme Park, Exquisite Corpse, Giving Ground (edited with Joan Copjec), Wiggle, Local Code, Some Assembly Required, The Next Jerusalem, After the World Trade Center (edited with Sharon Zukin), Starting from Zero, Against the Wall, and Indefensible Space. Forthcoming are Twenty Minutes in Manhattan, Eutopia, All Over the Map, and Project New Orleans. Sorkin is also President of Terreform, a non-profit organisation engaged in urban research and advocacy and President of The Institute for Urban Design. Following the panel discussion DSGN AGNC will have a reception and draft previews of a Zine on Critical Activism we will be working on during the artist residency at the Austrian Cultural Forum. 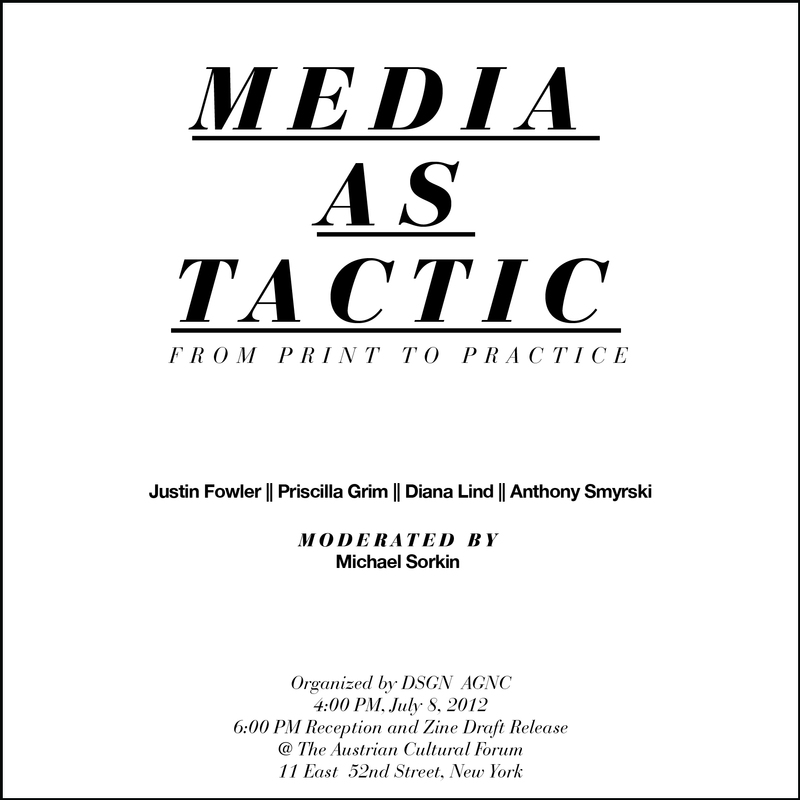 The Zine will document and expand on the Critical and Activist practice: A Discussion and MEDIA AS TACTIC: from print to practice.